David McCallum, the young Scottish actor who co-stars as U.N.C.L.E. agent Illya Kuryakin in NBC-TV's THE MAN FROM U.N.C.L.E., currently receives more fanmail than any other single TV personality. But how may of David's legion of fans know that their idol once created a sensation by portraying a monster? If David had followed his father's advice, he probably would have wound up making his living in an orchestra pit instead of playing monsters and super-secret agents. His father, a musician all his life, suggested that an actor never knows where his next meal is coming from. "Be an oboe player," advised McCallum Sr., tucking his Guarnerius under his chin. "Acting leaves much to be desired." David was earning on $35 a week at the time. Last September, McCallum Sr. arrived In New York for the beginning of a 58-city tour with the English orchestra leader Montevani. What he saw in the next eight hours was enough to make his eyes bug out. The Scots may be stubborn, but Mr. McCallum has changed his mind about David's choice of a career. All along the streets of Manhattan, perfect strangers ran up to embrace and congratulate "Illya." Girls gasped and squealed. The first time this happened, McCallum Sr. thought the young lady had been taken sick, but he soon realized it was teen-age adulation commonly known as Illyamania. Born in Glasgow, David did study the oboe briefly as a child but broke away for a life in show business soon after entering his teens. He began work as an electrician in a British theater when he only 14. "It was many years before I got to act," says David. "While I was watching and learning I did just about every job there is to do in a theater." Soon he was appearing in British motion pictures, and, shortly after coming to the United States to portray Judas in THE GREATEST STORY EVER TOLD, he reached the pre-Illya pinnacle of his career by donning monster makeup for TV's OUTER LIMITS. How can you see the McCallum monster? When the syndicated reruns of OUTER LIMITS hit your area, keep on the lookout for an episode titled The Sixth Finger. The diminutive actor appears in this TV film as a translucent, machine-altered man of the future who lives by photosynthesis. The story goes as follows: On a hill overlooking a Welsh mining town, electronic scientist Mathers (Edward Mulhare) has made astounding discoveries in the field of genetics. Working with a machine which uses high frequency electronics on a molecular level, Mathers has found a way to speed up the process of evolution. A young miner (David McCallum) volunteers to be the first human subject. The initial jolt of power has an instant effect. Immediately, he has more intelligence and understanding--and his body evolves as well. His forehead is higher, his eyes brighter... and his fingers, long and sensitive, now have three joints instead of two. The stub of a sixth finger begins to grow. The evolution continues until he represents the man of one million years in the future. 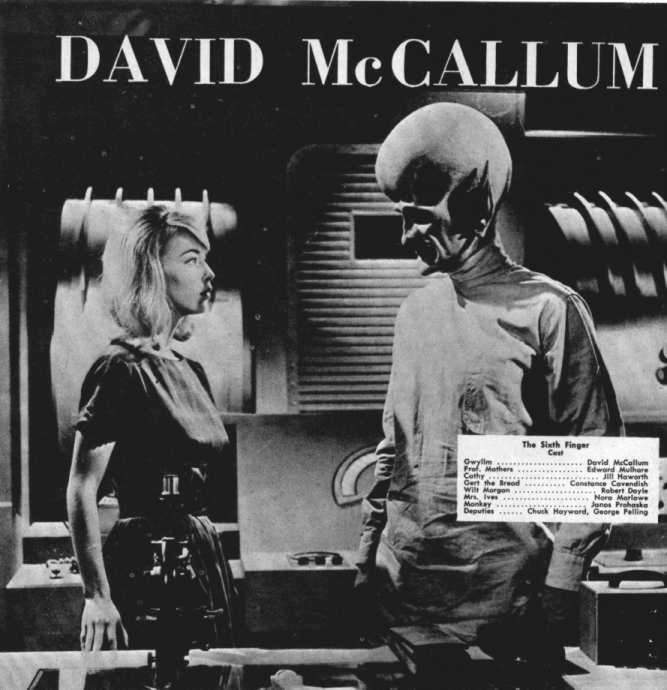 The incredible creation that McCallum portrayed in this 60 minute OUTER LIMITS show bears a startling similarity to his next motion picture role, the lead in George Pal's forthcoming color and scope production of Olaf Stapledon's ODD JOHN. One of science fiction's great classics, ODD JOHN explored the problems that Homo Sapiens will encounter with the next step in evolution. The property has been in the pre-production stages for several years, but not until dynamic David revealed his acting skills as Homo Superior in The Sixth Finger did ace fantasist Pal realize that his search was over for an actor who could play Stapledon's superman.